The news that President Donald Trump had fired him came so unexpectedly, that FBI director James Comey laughed it away thinking someone was playing a prank on him. Comey, was addressing a group of FBI employees in Los Angeles when a television in the background flashed the news that he has been fired, which he considered it as a prank, New York Times reported. His staff reacted by asking Comey to step into a nearby office. Comey stopped addressing the group and proceeded to shake hands with the employees he had been speaking to, following which he stepped into a side office, where it was confirmed that he had been fired. The news of Comey's dismissal by President Trump stunned Washington, as he was the man who had been leading the investigation into potential ties between the Trump campaign and Russia. 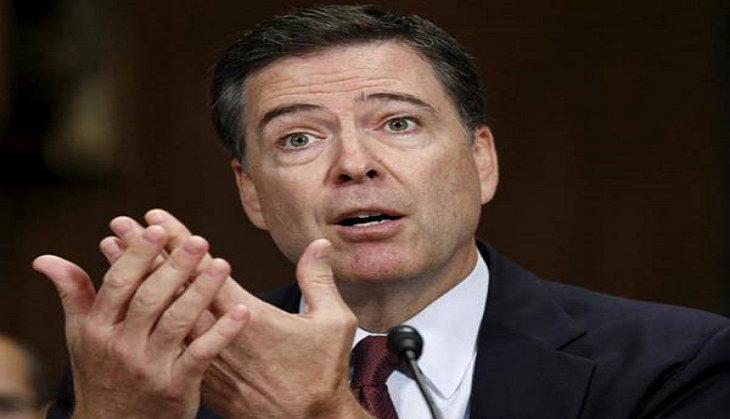 However, the White House announced that James Comey has been fired as director of the FBI over his handling of the Hillary Clinton email investigation. The Richard Nixon Presidential Lobrary and Museum used Twitter to issue a rebuke to the idea that Comey's firing was "Nixonian". Despite Nixon's firing of the Watergate special prosecutor in October 1973 and the resignations of the attorney general and deputy attorney general in the "Saturday Night massacre", he never fired the FBI director, the library said. GOP congressman and Freedom Caucus member Justin Amash has said he wanted an independent commission on Russia to be set up in the wake of Comey's sacking, The Guardian reports. Senate minority leader Chuck Schumer has called for a special prosecutor, adding, "If we don't get a special prosecutor, every American will rightfully suspect that the decision to fire #Comey was part of a cover-up." Clinton's former vice presidential candidate tweeted, "Trump firing Comey shows how frightened the Admin is over Russia investigation." While Senator Bob Casey called the termination "Nixonian" in a statement, several Democratic officials compared Trump's decision to Richard Nixon's "Saturday night massacre" when the president removed the special Watergate prosecutor, Archibald Cox, leading to the the resignation of attorney general Elliot Richardson, The Guardian reports. Congressman Elijah Cummings, ranking member of the House Committee on Oversight and Government Reform, has called for "immediate emergency hearings" on Comey's termination, The Guardian reports. John McCain, the Republican senator from Arizona, has been repeating his calls for a special congressional committee to investigate Russia ties.